See our full range of FSC approved solid wood labels. The majority of our products are manufactured on site and unless stated, are pre-treated with Danish Oil. To prolong the life of your labels, please treat with wood preserver on a regular basis. Blank Wooden Seedling Labels (Pack of 50). Ready to be written or engraved on to. 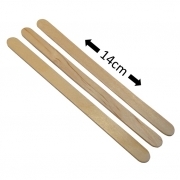 Blank Oak Stakes (Pack of 5). Ready to be written or engraved on to. 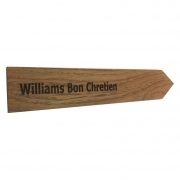 Engraved Oak Stake, available in two size options. 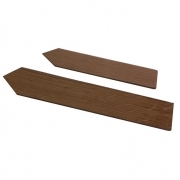 Engraved Rectangular Wooden Hanging Label. Supplied with single hole and slots for either tree label fixings or tree ties. 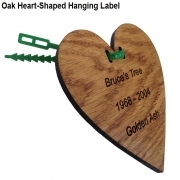 Engraved Heart-shaped Wooden Hanging Label. Supplied with single hole and slots for either tree label fixings or tree ties.